• Place potatoes in large saucepan with water to cover by 1 inch. • Bring to boil over high heat; reduce heat to medium-low and cook at bare simmer until just tender, 40 to 45 minutes. • While potatoes are simmering, mince 1 garlic clove. • Place minced garlic on cutting board and sprinkle with 1/8 teaspoon kosher salt. • Using flat side of chef’s knife, drag garlic and salt back and forth across cutting board in small circular motions until garlic is ground into smooth paste. • Transfer to medium bowl and set aside. • Mince remaining 4 cloves garlic. • Place in small saucepan with 1/4 cup olive oil and cook over low heat, stirring constantly, until garlic foams and is soft, fragrant, and golden, 5 minutes. • Transfer oil and garlic to bowl with raw garlic paste. • Drain cooked potatoes; set food mill or ricer over now-empty saucepan. Using paring knife, peel skins from potatoes. 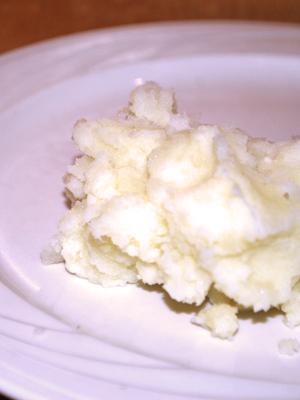 Working in batches, cut peeled potatoes into large chunks and process through food mill or ricer into saucepan. • Add remaining salt, pepper, lemon juice, and uncooked olive oil to bowl with garlic and cooked oil and whisk to combine. • Fold mixture into potatoes and serve.